Bad news gets press. "If it bleeds, it leads." Good news tends not to spread as well and as far. We all know about the horrible events of August 12, 2017 in Charlottesville, where protests and counter-protests over the city's plan to tear down a statue of Robert E. Lee ended in violence and a woman's death. It was a low spot in the year. It was a low spot in recent American history. But what most of us don't know about was a recent event in Charlottesville, on the first weekend of December 2017. I didn't even know about it until I was talking with Dr. Mark Beliles, who pastors a church in Charlottesville. I wrote a book with him once on the faith of Jefferson, Doubting Thomas (2014). After the tragic riot there, Mark Beliles, as a white minister in Charlottesville, teamed up with a black minister, Dr. Alvin Edwards (a former Charlottesville mayor), to organize the December 1 and 2 event they called "Healing 4 Charlottesville." By admission, their politics and backgrounds are quite different. Nonetheless, there is too much at stake for them to not join forces together. A. Larry Ross Communications writes, "National leaders joined the city's Christian community Saturday for Healing4Charlottesville, a day of prayer to encourage peace, healing and reconciliation after the tragic racial violence of last summer." Beliles, who is also the founder and president of America Transformation Company, said, "We believe that [healing] starts not by continuing to blame others but by humbling ourselves and finding out what we can do different and what we can do better." Edwards, pastor of Mt. Zion First African Baptist Church, declared, "I believe healing the city begins with prayer. But after prayer, not only becoming hearers of the word, but doers of the word...It's not just about today. It's about what's going to happen afterward. Scripture teaches us if we come together in unity, we can make a difference wherever we go." Beliles and Edwards wrote a joint op-ed for a local paper in Charlottesville (Daily Progress, 12/3/17), saying: "And so, we want to state emphatically, that we both love our city, and even more, we love our Lord and Savior Jesus Christ, and are loyal to His Kingdom even more than to any earthly political party. We are also friends who respect each other and believe that we can find common ground and work together for good of our Lord." They continued, "[W]e acknowledge that our City is very divided, as well as churches....We respect and celebrate differences and diversity, but we believe that these are serious times in our city and nation, and that we need to find some common ground for the good of our city." 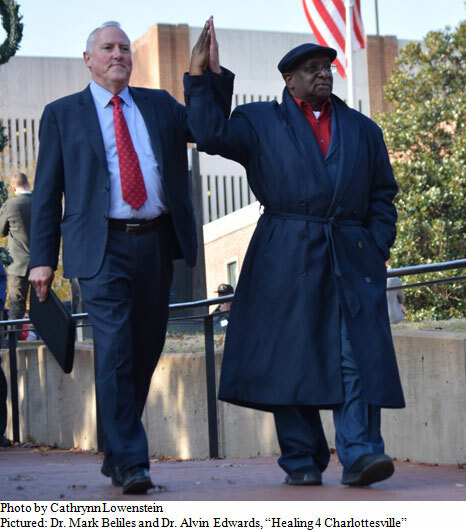 Beliles told my radio audience recently about his relationship with Dr. Edwards, both of whom settled in Charlottesville in 1981: "We've been friends and we've done things together – even though we're very different....But he and I both believe that Jesus Christ can transcend the politics and the divisions in our country. So we worked together to organize something in response" to the August tragedy. I asked Beliles about the comparative make-up of the August Charlottesville riot with that of the December Charlottesville prayer rally. He estimated that there were about 1300 at the August melee – about 1200 of which came from out of town. In contrast, the unity prayer rally in December was only about 200 people. However, the vast majority of these were Charlottesville residents. Hence, more people from Charlottesville attended the peaceful prayer rally than attended the August riot. The prominent African-American bishop, Harry Jackson, who is the Chairman of the High Impact Leadership coalition and the pastor of Hope Christian Church in Beltsville, Maryland, spoke at the prayer rally. I asked Bishop Jackson why he chose to participate. He told me he was glad to see the churches of "different denominational stripes" working together to bring about real interracial healing and to meet the needs of the community. "It was a great investment of time and energy." Jackson was pleased that the church leaders have come up with a 7-point strategy for positive changes, using the churches as a key for transformation of the community. Jackson told the rally: "Many of us have been looking to politics to fix our problems. The reality is the government cannot fix these problems....The church has been, in some ways, complicit with the problem, because we never said, 'On this day, on our watch, the madness stops.'" Jesus Christ is ultimately the solution to the racial divide in America. As Isaiah the prophet foretold: "For to us a child is born, to us a son is given, and the government will be on his shoulders. And he will be called 'Wonderful Counselor, Mighty God, Everlasting Father, Prince of Peace.'"